Monográfico sobre el sello CerebralAudio, vinculado al blog The CerebralRift. Este es el último programa de la temporada, hemos decidido tomarnos un descanso para atender otros proyectos. ¡Hasta pronto! Programa dedicado a The Loving Knives, el proyecto del músico estadounidense Nick Jones. Como anexo a nuestro monográfico sobre el músico francés Monplaisir, hoy repasamos algunas canciones de otros artistas incluidas en su selección Awesome CC-By, CC0 and PD music. Terminamos el monográfico sobre el músico francés Monplaisir y sus diferentes bandas y proyectos. Empezamos a repasar la discografía del músico francés Monplaisir, antes conocido como Alpha Hydrae. 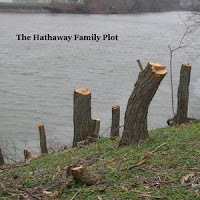 Here is our interview by email with Kevin McFadden of The Hathaway Family Plot, whose music was featured this week in Intangible 23. Have you ever played with other musicians or given concerts? 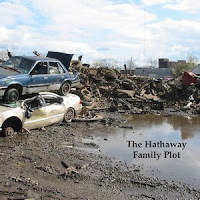 The Hathaway Family Plot has only played a live concert once. It was a slapdash impromptu affair, thrown together when a local band opening for Icy Demons backed out. My friend suggested we throw together some local improvising musicians and do freeform versions of The Hathaway Family Plot songs with no rehearsal or planning. I think my friend, who played drums for this concert, was the only one who even had heard the songs, previously. It was probably a huge mess, I'm somewhat glad I don't have a recording of it because I'd probably be rather embarrassed with it, now. That was around the time of my first album, so we did versions of "Angus Point Deer Processing", "The Millard Fillmore Appreciation Society", and some others. Otherwise, I occasionally improvise or jam with other musicians, but not often and not within the confines of The Hathaway Family Plot. I know this probably sounds pretentious or cliché, but my main goal with this musical project is to sound like nothing else out there. Of course, I have copious influences, but they manifest in subtle ways, and they might not be the types of music you may expect. Charles Ives has always been a hero of mine and, for instance, his three Quarter Tone Pieces for two pianos helped (mis)shape my musical ears. I would also point to Mauricio Kagel in the art music world. When I first started this project, I was very inspired by the early records of Jandek. Tom Waits is a huge influence, and a band called pAper chAse has loomed over me, lately. Some artists I take inspiration from who have released CC albums include Violeta Paivankakkara and Ak'chamel. But then I'll take little ideas from any music I love, like Sigur Ros, Stan Getz, or Tom Zé, but I can’t imagine anyone would compare my music to any of those artists. How would you describe the process of writing your music and lyrics, coming up with the arrangements and recording? It's both spontaneous and laborious. I typically decide on the form of a song spontaneously, just laying down a drum track or a piano improvisation or something, with no idea of what the finished product will be. I gradually fill things out around it until a song starts to emerge. But I rarely alter the form of the song or start a song over from scratch. If what I started with isn't working, I scrap it and do something else, entirely. Sometimes songs come together quickly, while other times I'll be recording additional instruments or twiddling knobs or adjusting levels for months. I'm not very good at the technical aspects of home recording, so I think a lot of my songs sound kind of shoddy, but at least in the last 3 or 4 albums, I really do spend a lot of time working on the music. My first albums were more quickly thrown together: have an idea, throw down some tracks, done. How do you pick the photographs for your album covers? Did you take them? Are those landscapes from your city? How do they relate to the music? I take all of the pictures, and yes they are all from Buffalo, New York, where I currently live (except the cover for the Easy Winter Instrumentals, which was taken at a state park about 200 kilometers east of Buffalo). I love to wander around the city and take pictures of what I see. The abandoned buildings I photograph often make it onto the covers of my albums because they fit the broken aesthetic of my music. They also fit because this entire project is handmade in an honest DIY way. I don't have a fancy camera, just like I don't spend a lot of money on new musical instruments or effects or equipment. I don't edit the photos or add any filters just like I generally eschew MIDI or drum machines or anything else that feels too antiseptic to me (of course, that's not to say I don't use electronic effects: my music goes through a lot of manipulation, to be sure, but only in ways that feel organic and honest to me). The covers of Worry and Mechanics were taken not far from my neighborhood, though I must add that decrepit buildings and cut-down trees are not all there is in Buffalo. I have many photographs of parks and hillsides and leaves and other more conventionally beautiful things. Around the time of my Instrumentals EP, I toyed with the idea of introducing more conventional beauty into both my music and the cover photos. But that's not where my music took me for Mechanics, and now with the political situation in the U.S., my next work will probably be even more angry and loud, so the aesthetics won't be changing much in the near future. What are your thoughts about realeasing your music under Creative Commons licenses? How has been the experience so far? When I first started releasing music under the CC license, it seemed like a novel, forward-thinking way to introduce my music to listeners across the world. I didn't polish or refine my first few albums very much, and I couldn't imagine any right-thinking person would pay money for them, so it made sense to give them away for free. This project has always been about the joy I receive from making the music and expressing myself, not monetary gain or dreams of popular success. It's been incredibly fulfilling when I see that a German theater company used my song in a promotion, or that a choreographer in Mexico or Argentina used my music in a dance, or a wedding photographer here in the states somehow used my music in a wedding video, or that a radio program in the Canary Islands is interested in my music. These days, though, everyone is giving away their music for free, or nearly free, with streaming services, so I've wondered if I would get more exposure by putting my stuff on Spotify/Tidal/etc. But I do like the feeling of community among Creative Commons artists and it's not something I want to give up. My music is never going to be popular to a wide audience: if my choice is between making a nominal pittance or making nothing at all and being "free" from the artistic constraints that arise when money gets involved, then I'm going to opt for the latter. Volvemos dos semanas después con un monográfico sobre The Hathaway Family Plot, el proyecto del músico estadounidense Kevin McFadden. Además, hemos publicado en el blog la entrevista en inglés completa que mantuvimos por correo electrónico con McFadden para preparar el programa. Hacemos un repaso al catálogo de la netlabel francesa Micr0lab. Esta semana proponemos un monográfico sobre la banda brasileña This Lonely Crowd. Todos sus trabajos los ha publicado el sello Sinewave. Escuchamos la música del grupo de anarquistas cristianos de Filadelfia Psalters.